Five years after two firefighters were killed in a fire in Boston's Back Bay that burned through a hose, there has been no change in testing or code. The pain is still severe for Kathy Crosby-Bell. “It has very slowly seeped into reality for me that he is not coming back,” she said. On March 26, 2014, Crosby-Bell lost her son, Boston firefighter Michael Kennedy, in a nine-alarm fire on Beacon Street. His partner, Lt. Ed Walsh, also died. The fire, whipped up by dangerously high winds, trapping them both. In the wake of the deadly blaze, investigators found that the intensity of the heat from the fire burned through their hose. Since her loss, Bell has founded the Last Call Foundation to fund research into fire safety. Teams at Worcester Polytechnic Institute are studying the attack hose material, the lifeline of a firefighter. WPI’s research has documented 174 hose burn-throughs around the country in 20 months, including a burn-through in Worcester and another nearby in Northborough. This issue has been on researchers’ radar for years. Notarianni has led research into fire protection engineering at WPI and while the protective gear the firefighters wear has improved, the hoses are virtually the same as those used a half-century ago. WPI researchers presented their findings to the National Fire Protection Association, which sets standards for firefighting gear. Current fire code does not require hoses to be fireproof, but rather heat resistant. “We had to raise the bar of what is in the code so these better hoses would be sold,” Notarianni said. WPI also wants a change in how hoses are tested. Currently, the test includes taking a hot block and placing it on the hose for 60 seconds. “The way they are testing is not representative. Why are they doing that? Because none of the current hoses could pass a more stringent test so it becomes the chicken or the egg thing,” Notarianni said. Now five years after the Back Bay fire, how we test hoses and what they’re made of is still being debated by the National Fire Protection Association. The organization says they hope to have new standards by 2020, and that new hoses will now be tested with an actual flame. “The firehose is their lifeline in so many ways,” Bell said. 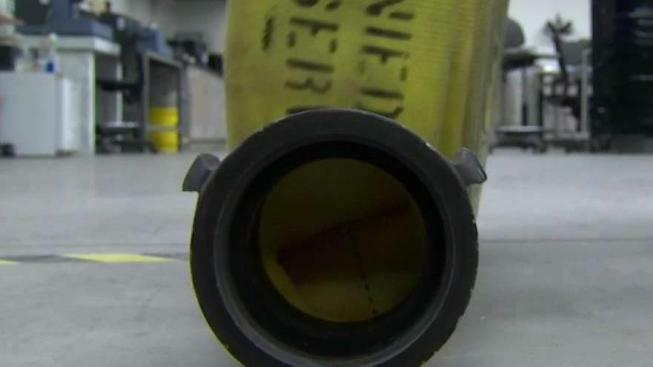 The NBC10 Boston Investigators called seven firehose manufacturers. Only one responded. That company says they know changes are coming but they don’t have new fire-resistant material yet.